I first saw these muffins on Rose’s 64 sq ft kitchen a couple of weeks ago and knew I’d have to try them out. Cilantro? In a muffin? With *rutabaga*?? I think the only time I’d ever had rutabaga was as a kid, where it was mashed with carrots. So the recipe sounded crazy — but just crazy enough to work! We brought the moist, savory muffins to Carrie’s holiday party. Mmmm… these are good, what’s inside? Rhubarb? Beet? No? It’s a veggie? Turnip? * To roast bell peppers, grill or broil the peppers, turning regularly, until the skin blackens and begins to peel. Place into a plastic bag and seal: the steam will help separate the skin. When cool enough to handle, remove from plastic; the skin should peel off easily. Preheat the oven to 400F. Butter and flour 12 muffin-pan cups. In a bowl, stir together the all-purpose flour, buckwheat flour, baking powder, salt, ground black pepper, cilantro and the ground coriander. Beat the eggs until blended. Add the milk, oil, honey, red peppers and shredded rutabaga and beat until blended. Add the dry ingredients and mix just until moistened. 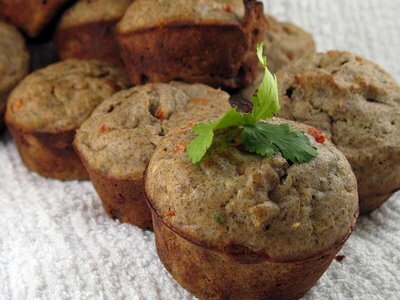 Spoon the batter into the prepared muffin-pan cups. Bake for 15-18 minutes until a toothpick inserted in the center comes out just a little moist. Do not over bake them. Let them cool in the pan on a wire rack for two minutes, and then invert them onto the rack. These muffins can be stored for up to 2 days in an airtight plastic container. This entry was posted on Saturday, December 8th, 2007 at 12:14 pm	and is filed under Breads and Muffins. You can follow any responses to this entry through the RSS 2.0 feed. You can leave a response, or trackback from your own site. I remember Chris’ Comment when he saw the muffins on my blog: “these sound completely nuts…” I laughed at your comment but I guess you were brave enough to try them out ;)I am glad you and your friends enjoyed them.